You’ll know Mark Cavendish won the 2011 World Championships road race in Copenhagen. 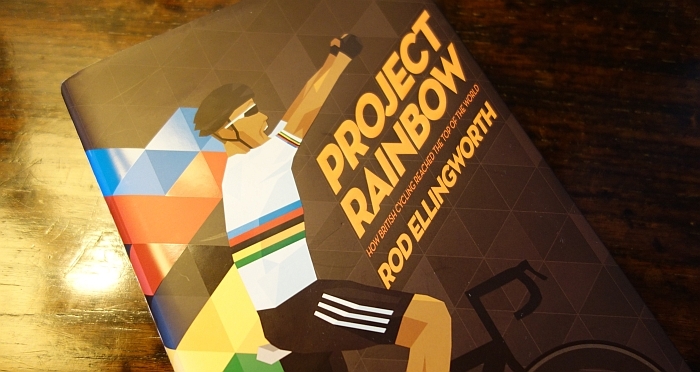 The book’s cover features a graphic of Cavendish in the rainbow jersey and the book opens with an account of being in the team car at the worlds. So why read a book with such an obvious literary spoiler? Because the book is so much more than the road to Copenhagen, the rainbow jersey and one superstar rider. Instead it’s about the systems in place, the ways of working and an unsung hero behind all the processes and performances. Structure and discipline: take some good riders, put them in a system and some will come out at the other end with gold medals. If it sounds simple, it’s not and Ellingworth is here to tell the tale, from his experience of a rat-infested dwelling in Belgium to Team GB and their private jet. Ellingworth’s career has matched British Cycling’s rise and this book tells the part he’s played. Early on Ellingworth identifies that a team is much more than just showing up for a race, pedalling and then going home. I knew what I wanted: a crack squad of lads who behaved themselves, knew where the line was, had a good time and loved their sport but respected the people around them. When it came to discipline, I wanted to go straight in – whack… …I like the ethos of the Russian system or the army – that hardness, being a unit. Forming young men into a cohesive unit starts at the dawn of military history. It’s not unique in cycling either, Dutchman Peter Post ran TI-Raleigh with an iron fist, “Charlie” Walsh and Shane Bannan cracked the whip on the Australian track programme. Team Sky DS Nicolas Portal can tell Ellingworth about his time as an U-23 with Michel Puntous, a coach nicknamed “The Russian” for his sado-militarism. Every team want this cohesion, even a good group ride needs it. By now we know the five Ws of the British success story: who, what, when, where and why. But this is the “how” section. How can you take young riders and improve them? How can you innovate in pro cycling? There’s even a short section for amateurs to illustrate these techniques towards riding the Etape du Tour. It turns out you need a stationery cupboard before you fill a trophy cabinet. Behind every gold medal is a pile of paperwork, a stack of laminated cards and today, a Dropbox account. Perhaps the book is self-selecting but there are early pen-to-paper moments which appear defining. Early on Ellingworth is writing a letter to the local townhall to request some funds so he can take part in more events. Later he’s hand-writing job applications, advising neo-pro “Cav” to write to his T-Mobile team managers to give him a spot in the Tour de France. Today a week ahead of a race Sky’s riders are emailed sheets detailing the team’s expectations of them and their duties ahead during the race. Marginal gains and tech play their part but they’re the visible element, what probably makes a much bigger difference is managerialism and the simple act of writing things down, whether house rules for a group of U-23 riders or specific tasks for pros to complete during the worlds, for example “pull from X km to Y km”. This isn’t the definitive guide to British success. Right from the start money matters as Ellingworth pens letters asking for tiny sums from his school but the six-figure sums needed later on are barely mentioned. There are several times when Ellingworth tells boss Dave Brailsford that he needs to do something new, like a in-house training scheme for young riders or to set up an Italian base for the British U-23 team and the answer is always yes, presumably because the money is there. Big spending thanks to lottery money has been a necessary but not sufficient part of the British Cycling story only in this book there’s barely a reference to the prodigious resources available and the advantages these bring. The book invites you think about what is not written down. Riders join the British Academy full-time and their only education during the process appears cycling-related: bike mechanics, French and cookery. Ellingworth writes perhaps Ed Clancy could have gone to university but it wasn’t going to help with cycling, implying it would be a waste. It’s certainly a contrast to the system in France where a rider can complete a degree course whilst racing at elite U-23 level. Perhaps the British system is superior in forming a rider but for every rider who makes it as a pro there must be many are dropped without an education. This is not their story. The book cleverly introduces Mark Cavendish as the classic rough diamond – revving across a car park in a gold car with “007 Goldfinger” written across the top – who has talent but does not look the part. If anything his personality and ambition stand out more than leg speed or tactical sense. The book’s cover suggests the coaching tale of Mark Cavendish but it’s much more although presumably the celebrity factor of Cavendish is needed to promote the book to a wider audience. By the time Cavendish appears he’s only one rider amongst others and this is really the story of British Cycling’s U-18 and U-23 teams and the systems and structures behind them. Nevertheless Cavendish comes out of the book well. The pro road team should be the crowning achievement but there’s a wistful tone. Ellingworth sees his techniques and structures in place but others are in charge. He’s got his criticisms, a difference in approach with Scott Sunderland, apparent tensions with Brailsford, the working relationship with Bradley Wiggins doesn’t work out and even Cavendish comes in for a year only to leave. You sense he’s got to bite his tongue but the tone is noticeable. It’s hard to know if Ellingworth and his colleagues are visionaries or doing the obvious; sometimes they are just copying what others have done, for example aping the Australian cycling system but also looking for success elsewhere in sport like the English rugby team. Decisions aren’t imposed instead an athlete will decide for themselves. Ellingworth, with advice from psychologist Steve Peters drops hints, a trail of mental breadcrumbs but it is for the rider to “buy in” when they’re ready. It’s obvious given they have to do the training and take the risks on the banking or a descent, they need confidence and commitment. It might sound obvious but sport is different from other domains. Pro cycling is full of ex-pros and this means riders who won 25 years ago are in management today. Consequently team policies are built on empiricism and tradition, a fancy way of describing the culture of “this worked for me in 1980-something, so it’ll work for you”. Nowhere is this more obvious than in French and Italian teams – bonjour sirop in your bottle; ciao the same hotel for a training camp as 25 years ago. But Ellingworth and the Brits are outside this and so come with a fresh approach. Then again the likes of Cyrille Guimard and Manolo Saiz have been there before. But look at many teams today and plenty could do with hiring an Ellingworth. It’s an easy read thanks to journalist William Fotheringham’s writing. It’s often an exploration of managerial issues but never a textbook as it doesn’t stray far cycling. It is a book the non-cyclist in search of managerial tips could enjoy too as it’s not jargon-loaded. There’s an index at the back, ideal if you want to look up an anecdote or an idea again. You might know the end result but it’s the journey that’s the story. It’s not who is on the team or the races they won but the how and why. Rod Ellingworth isn’t a big name in the sport so his tale and that of British Cycling’s coaching structures has to be told through the rise of Mark Cavendish. But it works given Ellingworth’s association from the early days and even when Ellingworth is working with Team Sky he is coaching Cavendish at HTC-Columbia, the sprinter is a constant presence. This is much more than “my part in Cav’s success”, it is the tale of a system rather than the fluke discovery of one gifted rider. The rainbow jersey is won thanks to a team effort and it’s here we learn plenty as Ellingworth explains how he learns about teamwork, puts things into practice and helps people achieve their goals. It should be compulsory reading for other team managers. A list of previous book reviews is available here. Ellingworth is THE unsung hero of the success of British cycling (Shane Sutton doesnt get enough praise either but at least he is somewhat better known). Seeing what happened when Max Sciandri took over the the Academy and let standards slip over, was very painful to Ellingworth. It does seem to be on its way back up again – its brought through Simon Yates as well as Owain Doull, Sam Harrison and Jon Dibben, so it appears to be on the right track again. Re Ellingworth and Team Sky: its worth mentioning that Cav wanted Ellingworth to move with him to OPQS. Ellingworth would have got a pay rise in the process, but he still said no and elected to stay with Sky. He’s coach to Kennaugh’s as well as Stannard, Swift and I think Thomas. Be interesting to see how his proteges do next season…. Thanks, interesting re OPQS, I wonder if it was contractual or not with Ellingworth bound to Sky? One of the interesting things about Team GB and the newfound success on the road is how they try to make stage race winners. Wiggins became a stage racer at Garmin, Froome was bought in. There’s no template for them yet as to how to do this and the riders who look promising (Dan Martin, Yates Bros) seem to see that they have to go elsewhere to get their chance. While the pipeline may look fantastic, there’s still work to do for Ellingworth, that’s what keeps them interested, I think. Ellingworth mentions Dan Martin and how there was no room for him because he was a 60kg rider who could not be any use in the track pursuit squad. But he does say there are chances now with the Italian set-up that would have suited him. But you’re right, there is a mould and these riders have to fit into it. It’s similar with Australian cycling with Porte and Evans both doing things outside of the track endurance squad. Strictly speaking Adam Yates didnt move away from Sky – they didnt offer him a contract, only brother Simon. Sky were only interested in one brother, not both. I’ve no doubt that they’ll do well at OGE, but I think its good that they’ll get chances in another ProTour team. Sky want to give Edmondson and Dombrowski their launchpads next year in their second year – which seems only fair – and bring in Nathan Earle and Seb Henao as the two neos for next season. Ellingworth certainly has something special. I am not so sure the under 23 production line is still producing the same quality and quantity in his absence. Hard act to follow, certainly Scandri could not maintain the discipline and production line. Its probably in Sky’s best interest for some younger riders to spend the first couple of seasons with other teams. There is a limit to how many young riders you can cater for in a 27 rider squad. This spreading of young talent around other teams has always been one of SKY’s policies. Sciandri – great for having a laugh and a few expressos. Developing young riders – not so much. No one has bothered to mention the Sky/BC is set up exactly like USAC/USPS. BC has no incentive to enforce any rules when they are also responsible for SKy’s success. Given the priorities are clearly arranged for success/wins how can anyone be confident the sport is still a sport since the Hein/Armstrong/Wiesel sports fraud? To what extent was USAC responsible for policing USPS? It was the UCI and WADA rather than national federations. They have had reviews to try and separate BC from Sky but it’s clear there’s big overlap. WADA is not an anti-doping enforcer. They provide standards for testing for all parties and largely advocate clean-er athletes but cannot themselves open cases. They do things like warn the world sports federations are hiding positives, stuff that generally displeases Olympic sports, but they do not open cases. It is up to the testing authority to specify tests and open cases. Testing authorities are generally, the UCI for cycling, the National Federation and event promoters. USA Cycling is one party responsible for testing and processing recommended positives. They don’t test, or don’t process positives to suit themselves. In contrast, the whole Armstrong affair was where Armstrong’s/Wiesel/Hein tyranny came to an end as the athletes, besides Landis, did not report to the sports federation, but directly to USADA who then applied cycling’s sanctions and extended them a bit. All the riders knew Thom’s role in doping and USPS, so it was meaningless for them to notify USAC. You may recall an attempt by USA Cycling to intervene in the sanctions. That is the perfect expression of the corruption likely when a cycling federation is also running the pro team. The fox guarding the hen house logic seems consistent in the USPS/USAC confab. Without “arm’s length” controls between the federation and the mega-euro home team, greed seems likely to overwhelm a balance in ethics. One of the interesting things is, that Cav is the poster boy of the academy system, but a system where kids get no education and end up with nothing if they don’t hit the big time is not something that should be supported.Where are the other guys? Being a domestique for ten years on a pro team, getting paid an average wage can’t justify sacrificing an education imho. What do they do from age 35-65? As a note Team Sky leaders Fromme and Porte are not from the GB system. It reminds me too much of the east german/russian system. You throw all eggs against the wall and see which ones won’t break. Ullrich was the unbreakable egg, as was Cav. The russians often all broke. The Aussie track system is not much better, you’ll need some time to count all the Aussies that burned out at age 21-22. Again, Cadel, Porte, McEwen came from a different path. The Yates twins are still young and Adam did it on his own the last years. I would love too know a couple of statistics for all the national cycling programs payed for by its citizens. I would be interesting to see who does the most with less! Where has this ‘no education’ come from? The Academy is for +18yrs. Most of the guys have got at least some A levels by the time they join in the Sep – even if they are on the Olympic Dev Programme (u18) they’re often combining this with college. Even on the Academy they are learning French – as well as how to cook and organise themselves etc. If they don’t make it through the Academy they often secure a ride on an amateur team, and take a non-Academy route to turn pro (eg Adam Blythe). Or go into another area of cycling. Or go and study full-time. They’re still only 20/21/22 – their futures arent blighted because they dont have a degree. And I’m afraid having a degree in the UK is nothing like the guarantee for the way into a job that it once was – whatever age they are when they get that degree – 21 or 38. The Academy is not some kind of brutal system where the riders who don’t make it have their lives blighted forever. It’s an u23 development squad – more encompassing than just joining eg BMC Dev squad or Bontrager for sure. But still a development squad, of which there are a number across different countries. You might as well criticise the entire concept of u23 development set-ups. It’s just a point in the book where Ellingworth discusses a rider called Ed Clancy and says he thinks university would be a waste of time because it would be a diversion from cycling and it seems the rider is put off from going. It’s not that their future is blighted, just that it’s 100% bike. You can admire this in many ways but I noted the contrast with other systems where studies – not cookery lessons – form part of the programme. I wasnt responding to your comment so much, INRNG, but more Paolo’s 2 posts up. I should have made it clearer in my post. The software company has promised a fix for the comments on the mobile version of this site but I don’t know when it’s coming. Is Cycling similar to Football and F1, in that the top teams lend out their developing drivers/players to lower tier teams, to gain experience. But also retaining the right to continue to manage their protege’s careers or call them back to the ‘Host’ team at any time? Or are they just let go, but will keep an eye on them for future recruitment?